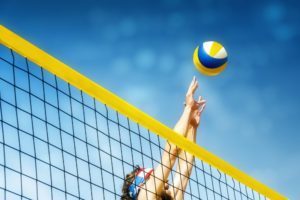 Volleyball is a fast and physical sport for which the player needs to move with agility and speed. Whether you’re a professional volleyball player or just play for fun you’ll need volleyball sneakers with excellent grip and exceptional support to protect your feet and ankles from the constant pounding on the hard-court surface. Courts can get quite slippery due to their hard surface so you need a shoe which offers exceptional grip to avoid losing your footing. Apart from possibly being quite painful, slipping over mid-game can also be quite embarrassing so this is something you want to avoid. Your volleyball sneakers need to have ample cushioning both under the heel and the mid sole to protect and cushion the ball of your foot and your heels from the constant jarring and pounding on the court surface. If you have low arches, you’ll need this extra cushioning to avoid having sore feet for days after your game. 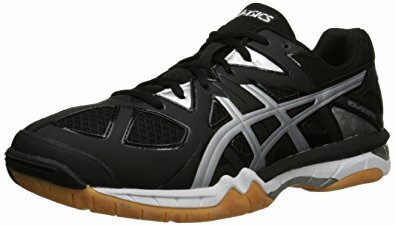 In a fast game of volleyball, you’ll be changing direction suddenly and quickly, therefore you need a shoe which offers both stability and security. This will eliminate the twisting of ankles and stop your feet from rolling sideways. 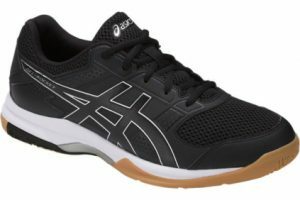 The ASICS Men’s Gel Tactic Volleyball shoe is an update of the popular Asics 1100 series and is especially designed for the fast-paced sport of volleyball. * Available in 2 colors (white/black/pale gold & black/onyx/silver) and sizes ranging from 6D to 15D. * Lightweight mesh and synthetic leather upper for exceptional breathability. * Removable insole for easy laundering and also to allow the fitting of an orthotic if you need it. * Rear-foot GEL Cushioning System to act as a shock absorber for your heels. * Mid-foot Trusstic System to reduce the weight of the sole and provide stability. * 2 layered SpEVA mid-sole for extreme under-foot cushioning. * NC Rubber out-sole to provide exceptional traction. * Toe guard for added protection and durability. * Padded tongue and collar to cushion your ankles and the top of your foot. * American Podiatric Medical Association Seal of Acceptance. The Rear-foot GEL Cushioning System provides excellent shock absorption for the heels. This ensures comfort and allows for a smooth transition to mid-stance. 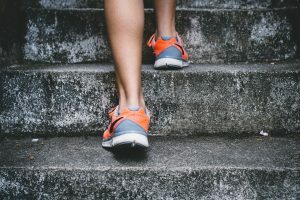 As your heel hits the hard surface, sometimes with considerable speed and force, you want to make sure that it’s well protected to avoid problems such as plantar fasciitis. Excellent breathability is achieved with the mesh and synthetic upper providing added air flow to keep your feet cool and comfortable while you’re running around the court. If your feet sweat too much inside your shoes, this could create friction and cause blisters to form. Keeping your feet as cool as possible is paramount in having an enjoyable game. The mid-foot Trusstic System ensures forefoot stability and also reduces the weight of the sole while still maintaining the structural integrity of the shoe. If you have a tendency to over or underpronate then you need this extra stability to stop your feet from rolling sideways. For enhanced traction, the NC rubber out-sole contains more natural rubber than traditional solid rubber. You can be confident you won’t slip over when wearing these volleyball shoes. The SpEVA mid-sole provides plush cushioning and comfort underfoot. This mid-sole has not one but two layers providing extra padding where you need it the most. This is especially important if you have low arches as more cushioning is needed to protect your feet from pounding on hard surfaces. The addition of a toe guard not only provides added protection for your toes but also ensures toughness and durability. To provide greater protection for your ankles the collar in these shoes is padded. This also ensures a snug fit and means that your foot will not slip inside the shoe. * These shoes are highly durable and are able to resist the constant wear and tear on the court. * They provide plush under-foot comfort with the additional layer of cushioning. * They are not only extremely light to wear but are also easy to maneuver in as they fit snugly on your foot. 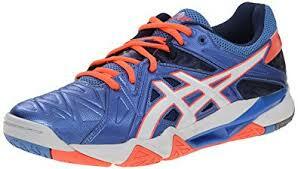 * These shoes provide exceptionally grip and traction on the sometimes slippery surface of a volleyball court. * The Asics GEL Tactics run true to size so you can be confident when purchasing online that you’ll get the perfect fit. * Not available in a wide fitting. Now that you’ve decided that the ASIC GEL Tactic Volleyball Shoes are just what you’re looking for, here are some tips for caring for your new pair of volleyball sneakers. * You can easily remove mud and dirt with a toothbrush, warm water and a mild detergent. * Do not wash in a washing machine as this may damage the structure of the shoe. * The sock liner can be removed and washed separately which is helpful in refreshing the inside of your shoes after a hard game. * Do not put your new sneakers into the dryer or near direct heat. * Stuff the inside with some paper towel or newspaper to absorb any dampness. 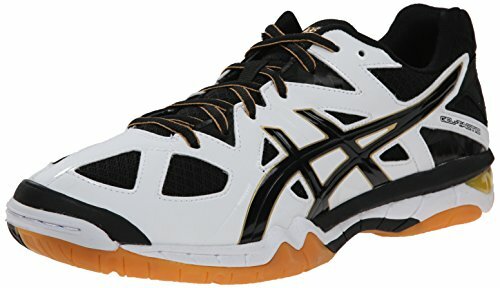 Whether you play professional volleyball or like to play a game every now and then for fun these volleyball sneakers will not only provide exceptional traction on the court, but they will also ensure that your feet are comfortable and well protected as you run and jump your way around the court. 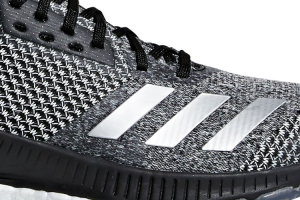 These volleyball shoes are currently setting at 4.5 out of 5 stars with 90% four stars or more, and only 10% 2 star.